Learn guitar with Mr. Todd Lutes! For the past 30 years, Mr. Todd has been playing music professionally. Starting his professional career on drums at the ripe old age of 15, Mr. Todd quickly realized that music was his path. At 18, he was accepted into the Berkley College of Music but cordially declined to pursue his own musical endeavors. After many years of playing drums and singing in bands such as Zepton Groove and The Brickyard Poets, Mr. Todd decided it was time to shake things up by switching to guitar. Mr. Todd taught himself guitar and for the past 10 years he has been happily playing gigs, both solo and with his duo Scratch & Dent. Private lessons are available on Tuesday evenings starting at 6:30 pm. Email the director, Allison Wilkins, or use the contact form to schedule private lessons with Todd. Choose a series of 3 or 6 lessons and pay for them in the online store. 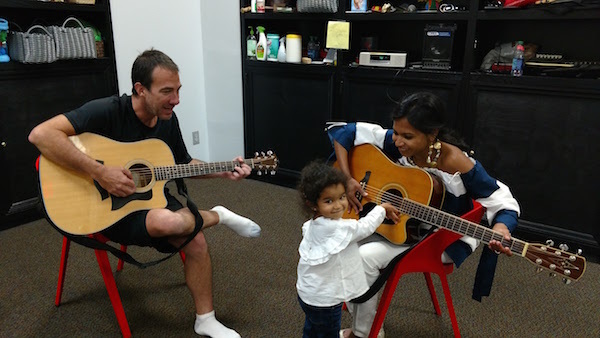 Please email director, Allison Wilkins, if you are interested in a small group guitar class.